A positive and uplifting atmosphere can set the tone for a resident’s stay. 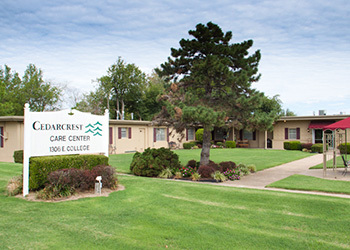 Cedarcrest Care Center employs outgoing and friendly professional staff to create social programs and activities. They often specialize in activities to match the capabilities and needs of each resident. This also has a powerful impact on the healing process. Each resident is given a calendar to keep them informed of upcoming events such as birthday parties, movies, musical programs, outings, and other special events. Friends and families are always welcome to visit and attend special events.